Currently viewing the tag: "breakfast"
Introducing, our new monthly feature – Baking with Corker and Mills! Nested is proud to be partnering up with the catering duo to get people really stuck into baking throughout the year. They make it look so easy, and so yummy. 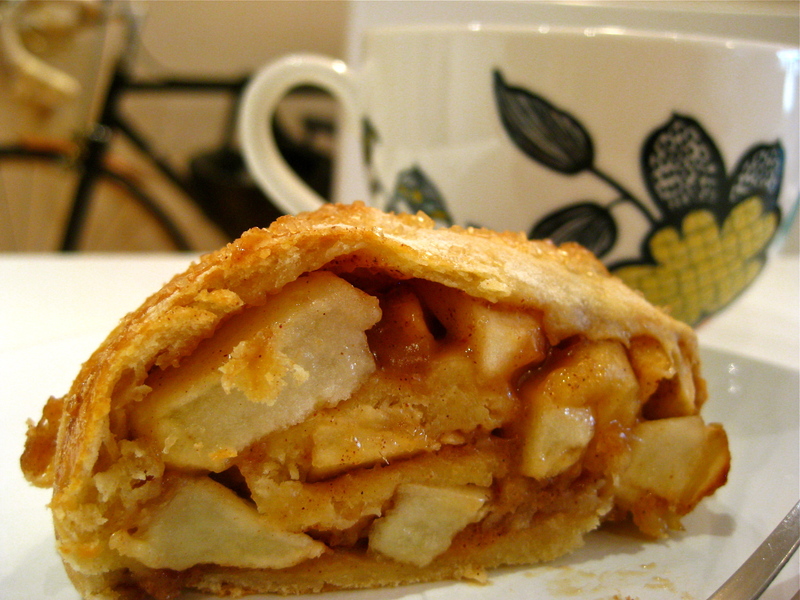 This month we’re diving in with a gorgeous treat from ‘American as apple pie’ Heather Corker. Autumn is the best time to bake. Chilly days just make you want to snuggle up to a lovely someone, don’t they? Or, in lieu of that, at least to make a nice steaming mug of coffee (or tea) to accompany a delicious slice of freshly baked cake. Its all pretty much the same thing, really – cake and love, love and cake (isn’t it?). The Autumn season is ripe (literally) with so many wonderful, wonderful ingredients to bake with. Pumpkins and apples and pears and figs, oh my! I get giggly and excited just thinking about it. Its a little bit like having a crush. But a baking crush. A big baking crush. Are you ready for this? Good. Apple pie meets cinnamon roll. Yeah, this is love. 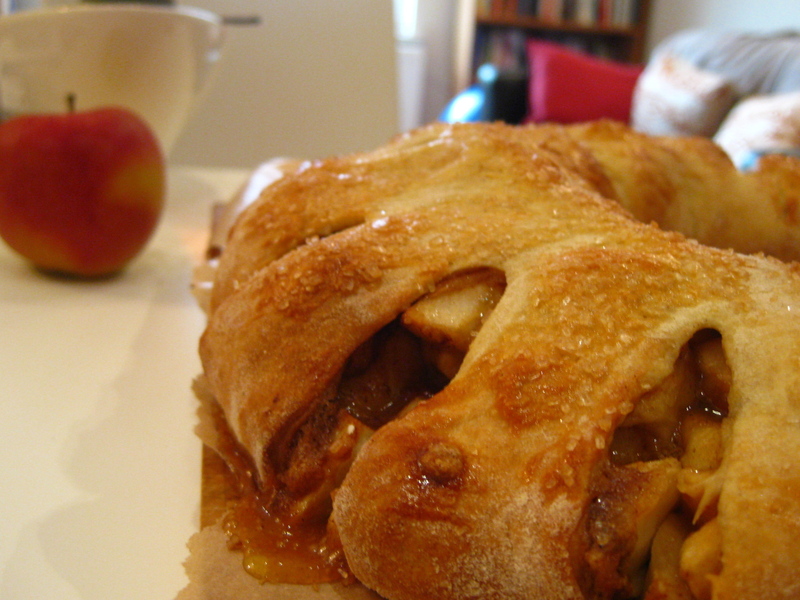 This is a wonderfully goopy and cinnamony delicious, appley sort of thing that I am deeming as a breakfast food (well, if the French get their croissants…). Now, if you are planning some sort of breakfast / brunch / get together with family and friends, something tasty for the kids on a weekend, this is sure to be a hit around the table. It takes a while to make – the yeast requires some patience – however it is a super simple recipe and nearly fool proof (the first time I made this the dough didn’t rise! But I used the dough anyway and it was scrumptious all the same). To Make the Dough: In a small bowl, mix together yeast, warm water and pinch of sugar. Stir together until yeast is dissolved and set aside for 10 minutes. Yeast will foam up. Stop the mixer, scrape down the bowl, and add eggs and 1 cup of flour. Blend on medium speed until thoroughly incorporated and creamy, about 1 minute. Stop the mixer and add 2 cups more cups of flour, yeast mixture, and warm milk. Blend in medium speed until the flour disappears. Mixture will be very wet. Add 1 1/2 to 2 more cups of flour. Blend until the flour is almost incorporated. Dump the dough onto a lightly floured work surface. Knead for 5 to 8 minutes by hand. Dough will be glossy and just slightly sticky. Place dough in an oiled bowl, cover with plastic wrap and a towel and let rest in a warm place for 1 1/2 hours, or until doubled in size. 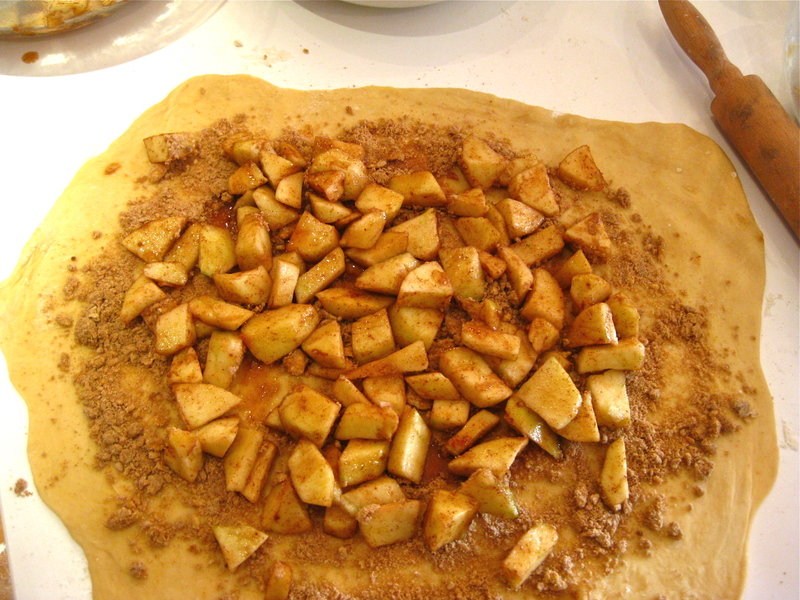 While the dough rises, make the apple filling and the streusel. 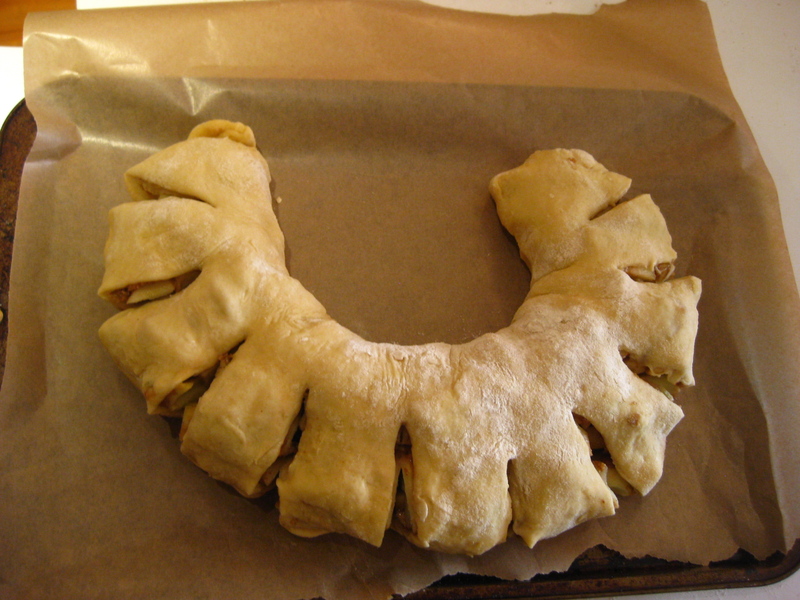 To make the Apple Filling, toss together diced apples, lemon juice, sugar, cinnamon, cornflour, nutmeg and salt. Leave at room temperature and set aside until ready to use. In a small bowl, whisk together flour, sugar, cinnamon, salt, and cardamom. Add butter and, using your fingers, work the butter into the flour mixture. Break up the butter into the mixture, until thoroughly incorporated and crumbly. Set aside. Line two baking sheets with parchment/grease proof paper and set aside. When the dough has doubled in size, dump it out onto a lightly floured work surface. 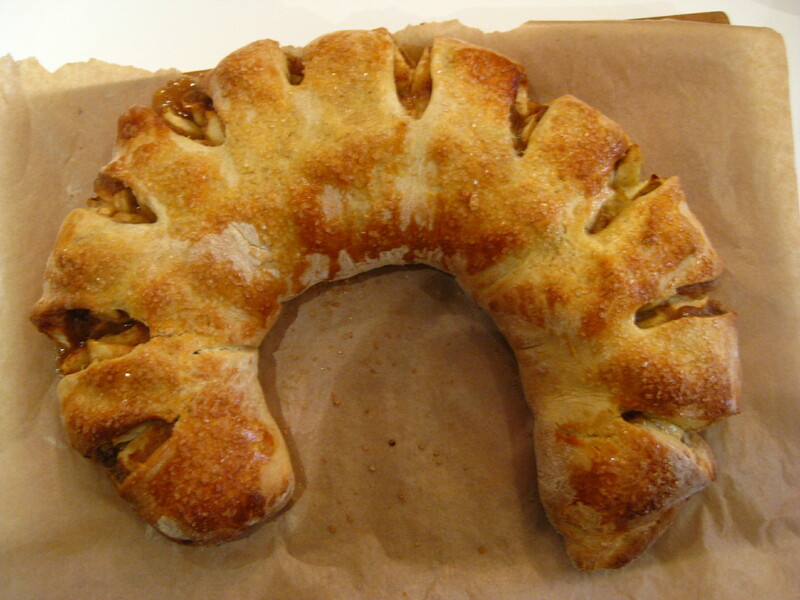 Use a large knife to divide the dough in two. Roll each dough piece into about a 10×14-inch rectangle. Sprinkle with half of the streusel mixture. 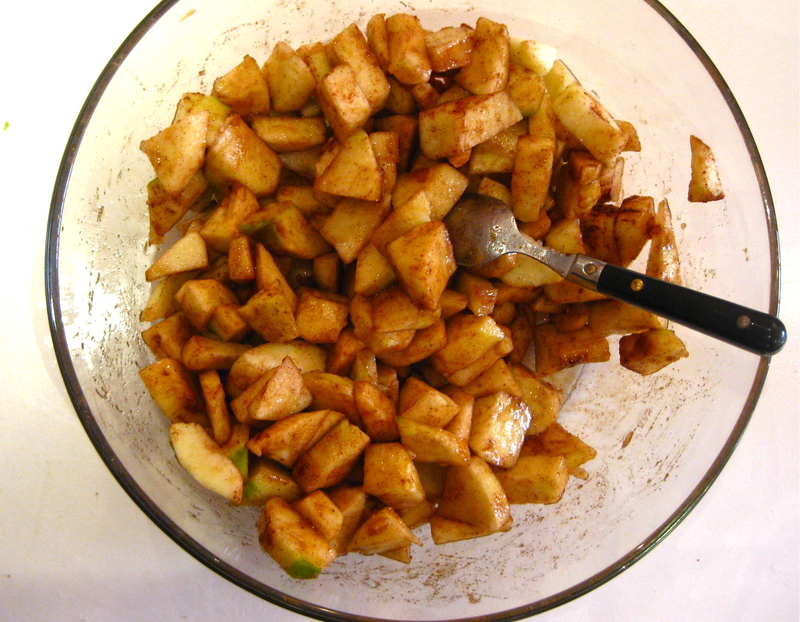 Add half of the apple mixture over the streusel. Add a bit of the yummy apple juices too. 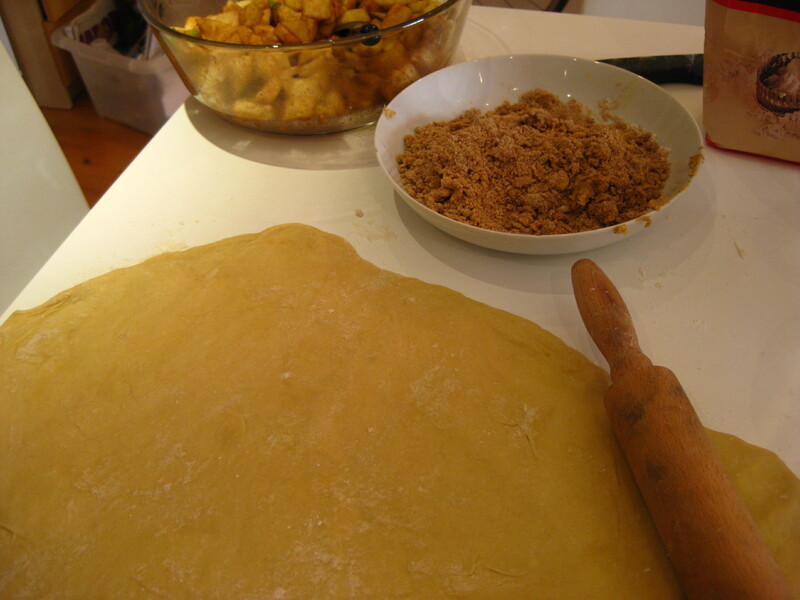 Starting from the longest side, begin to roll the dough. This isn’t like a cinnamon roll, you don’t have to roll it into a super tight swirl. Fold in about 1 1/2 to 1-inch folds. Keep the seam on the bottom. Repeat the same steps for the second piece of dough. Carefully lift roll onto the prepared baking sheet. Take a pair of clean scissors and slice into the dough leaving about 3/4-inch of dough still attached. Slice at 1-inch intervals. Carefully begin to curve the sliced dough into a semi-circle/horseshoe shape. 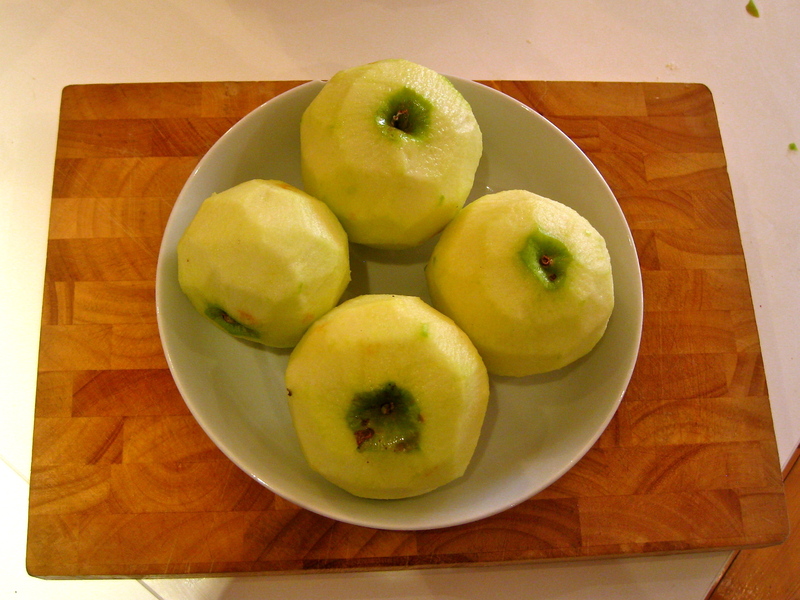 If some of the apple juices escape, that’s ok. Cover with a towel and let rest in a warm place for 30 minutes. Brush dough with egg wash and sprinkle with raw or granulated sugar. Bake for 30 to 35 minutes, until golden brown and cooked through. Remove from the oven, allow to cool for 15 minutes before serving. Best served warm with hot coffee or tea. Breakfast cake will last, well wrapped at room temperature, for up to 3 days… or 3 hours. ** If you decide to freeze the dough for later baking, place it in the fridge to thaw the evening before you’d like to bake it. Once it’s thawed, slice it according to the above directions. Allow to come to room temperature, and allow to rise for another 30 minutes beyond that. Wash with egg and sugar, then bake. ** If you decide to refrigerate the dough, simple take it out of the fridge, slice according to the above directions. Let come to room temperature, then allow to rise for 30 minutes beyond that. Brush with egg and sugar, then bake. Et Voila! You will be loved for ever and ever. Trust me. Can’t wait for November’s baking treat!